2017 will be remembered as the year of Illumination, the filmmakers behind Sing and the Despicable Me franchise. Despicable Me 3 continues the adventurous story of Gru, Lucy, their adorable daughters — Margo, Edith and Agnes — and of course the Minions. It is the best film in the franchise so far. Parents will particularly love the latest villain Balthazar Bratt for his passion for Eighties’ music and dance. Unmissable! After he is fired from the Anti-Villain League for failing to take down the latest bad guy to threaten humanity, Gru finds himself in the midst of a major identity crisis. But when a mysterious British butler shows up to inform Gru that he has a long-lost twin brother—a brother who desperately wishes to follow in his twin’s despicable footsteps—one former super-villain will rediscover just how good it feels to be bad. 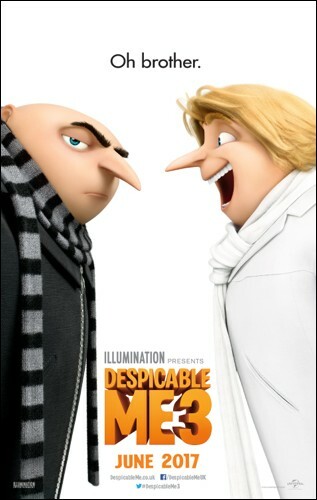 Steve Carell not only reprises his role as Gru, but also takes on a second part — that of Dru, Gru’s twin. Kristen Wiig returns as super-spy Lucy, while Emmy, Tony and Grammy Award winner Trey Parker voices new villain Balthazar Bratt, a former child star who’s grown up to become obsessed with the evil TV character he played in the ’80s. 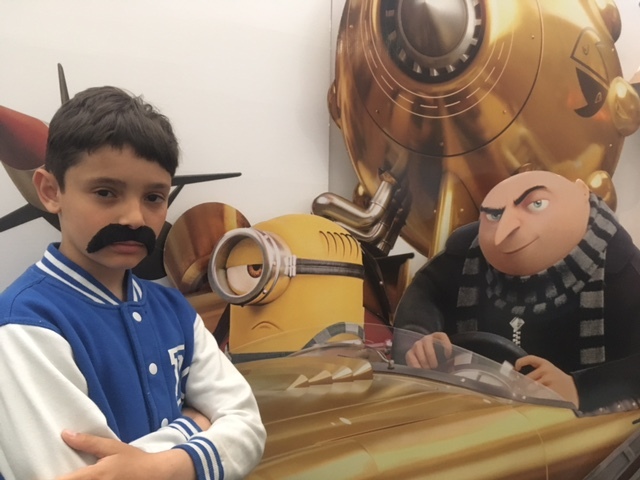 Gru’s most formidable and comedic nemesis to date, Bratt is out to take down Hollywood… and anyone who stands in his way. Grammy Award-winning singer/songwriter/ producer Pharrell Williams once again returns for Despicable Me 3 with new songs for the original motion picture soundtrack, available everywhere via i am OTHER Entertainment/Columbia Records. Pharrell’s Yellow Light is one of five brand new original tracks he wrote and produced for the film. Watch Pharrell and the Minions journey through the streets of Hollywood in a virtual video game in the music video for “Yellow Light” HERE. Another original Pharrell song made for Despicable Me 3 “There’s Something Special,” perfectly captures the tone of the series. Additionally, Pharrell’s anthemic “Freedom” serves as the perfect backdrop as the Minions plot their escape from prison in the film. In addition to Pharrell’s five new original songs, the soundtrack gets a healthy dose of nostalgia, thanks to the series’ new villain, Balthazar Bratt. Bad (by Michael Jackson) makes the perfect theme song for Balthazar. 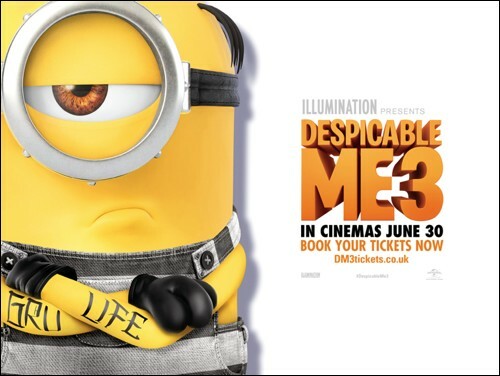 Once again illumination has not disappointed its loyal Despicable Me fans. 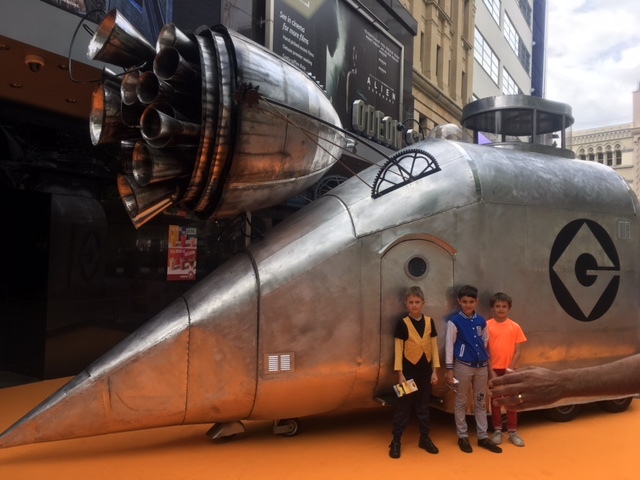 Kids absolutely loved the film! 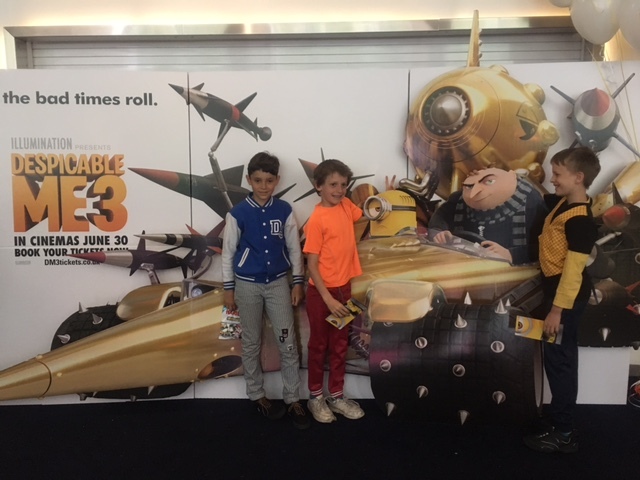 The movie has plenty of silly gags provided by the latest villain Balthazar Bratt, the Minions as well as the Grucie (Gru and Lucy) duo to keep the children happy but also lots of disco tunes from the Eighties to please the parents. Balthazar Bratt is a disgruntled former child star, a relic of the ’80s, when everyone knew him from a show called Evil Bratt. He wears shoulder pads and pump sneakers, tossing bubble-gum bombs and break-dancing his way through acts of villainy. His dance fights with Gru at the rhythm of Bad are epic. Although the Despicable Me animations seem spoof cartoony versions of James Bond films, they are ultimately family movies including lots of positive messages and values: learning how to be devoted adopted father and mother, acceptance of a long lost relative, friendship and loyalty to friends and family. The irreverent Minions’ story in this film is a bit disconnected to the rest of the plot, but their presence is essential for the gags they provide. At the end of the day, the Minions are the main reason these movies make millions. Fans of Despicable Me can be reassured that there will be a sequel soon with Gru’s brother as the villain joined by the villainy-thirsty Minions. Gru will supposedly be the softie dad villain turned good chasing his twin baddie after ‘giving him a head start because he’s family’. Personally London Mums and kids cannot wait to see it. 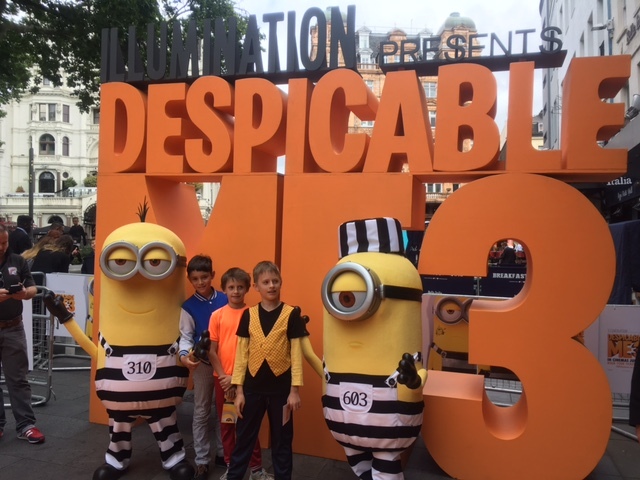 In addition to this summer’s Despicable Me 3, Illumination’s upcoming films — featuring creative contributors from an unparalleled collection of writers, artists, voice talent and musicians — include Dr. Seuss’ The Grinch in November 2018, The Secret Life of Pets 2 in July 2019, Minions 2 in July 2020, and Sing 2 in December 2020. Despicable Me 3 opens in theaters on 30 June 2017. This entry was posted on Monday, June 26th, 2017 at 5:01 pm and is filed under Movies. You can follow any responses to this entry through the RSS 2.0 feed. Both comments and pings are currently closed.